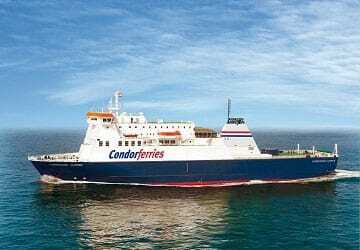 Founded in 1964, Condor Ferries originally provided a singular passenger service between France and the Channel Islands, but today, they operate a year-round service from the UK as well. Each year, over a million passengers and 200,000 vehicles travel with Condor Ferries, and in 2015, 'Condor Liberation' was added to the fleet, a state-of-the-art trimaran spanning 102 metres and the first of its kind in Northern Europe. On board every ship you’ll find all the facilities expected of a modern day ferry company including a great choice of bars and eating areas, a children’s area and a Bureau de Change. Condor Ferries’ UK departures ports are conveniently located in Weymouth, Poole and Portsmouth, situated with good access via Southern England’s main road network. 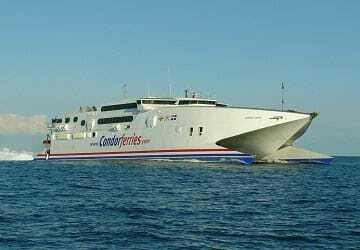 Condor Ferries destination ports of St Peter Port in Guernsey, St Helier in Jersey, St Malo in Brittany and Cherbourg in Normandy are all attractive port towns with great road access for onward travel, if your eventual destination is further afield. 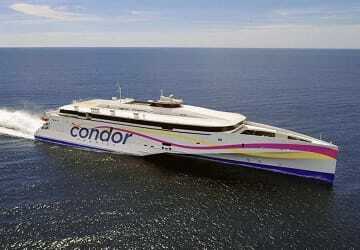 With directferries.com you can find Condor Ferries timetables, fares and book Condor Ferries ferry tickets. Where applicable we’ll also compare Condor Ferries with alternative ferry companies.